The Eastern European Festival in Deerfield follows the format of the traditional Polish Festival "Dozynki", named for the wreath or crown of wheat and flowers which symbolizes the harvest. Indeed this festival started as a celebration of visiting and feasting in between Christmas and Lent. In October 2009 the festival will realize its 17th year celebrating the art, food, music, and culture of Poles, Balkans, Russians, Ukrainians, and others. Traditional food such as Babka (a bread also known as kolach that is filled with apricot, raspberry, and poppyseed), pyrohy (filled dough with potato and cheese or sauerkraut), holubtsi (meat and rice stuffed cabbage leaves), and kielbasa are made by local chefs and go fast. Local artist Carol Kostecki has often demonstrated the craft of pysanky, the drawing of elaborate designs on eggs using beeswax. She sells her beautiful work for a very fair price. Festival organizers hope the event is educational, entertaining and enjoyable to all. Reba-Jean Shaw-Pichette, the 2003 festival director said " It's a very fun, very accessible day. " However, a festival goal is for people to come to learn about their family genealogy, traditions, and customs. For that reason Polish and Ukrainian genealogical societies are present at the festival to help draw family trees. 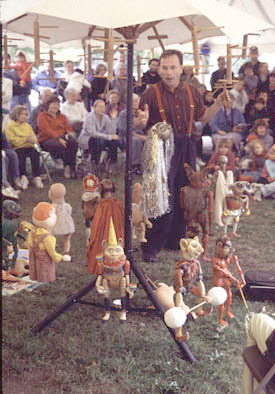 Past performances include folk music by Four Score, a quartet from Ashfield; a puppet show and workshop by Czech puppeteer Dusan Petran with Yorick's Marionette Theater; and Zolotyj Promin Dance Troupe, a group ranging in age from 7 to adult that dances to significant traditional songs. The festival is presented by The Pocumtuck Valley Memorial Association with support from the Massachusetts Cultural Council and local businesses.